MOSCOW (Sputnik) — The government of Japan’s Okinawa Prefecture plans to sue the national government in an attempt to halt the relocation of the US Marine Corps Air Station Futenma from the city of Ginowan in the south of the prefecture to the north of Okinawa, local media reported on Tuesday. The plans to relocate the Futenma Airbase were first formulated in the 1960s, but ever since the process has been put on halt several times. The current plans see the base relocated to the Henoko district of the city of Nago in the northern part of Okinawa. The construction works at the site have already started. According to the Mainichi newspaper, citing sources close to the prefectural government, Okinawa Governor Takeshi Onaga hopes to present their case to the local assembly during its June session. In the event the proposal is approved, the lawsuit could be filed as early as July, the newspaper continued. The local government will most likely approve the proposal, as the governor’s bloc has majority in the prefectural assembly, the media added. Japan’s government began the construction of a seawall in Nago at the planned new location of the base in April, and continued crushing reefs despite the expiration of prefectural government’s permission in March. According to the media, on May 29, local authorities issued an administrative guidance to the Defense Ministry's Okinawa Defense Bureau, calling on the department to either gain new permission or halt the project. If no response is given by June 1, the prefectural government plans to start preparations for the lawsuit, the newspaper said. The Futenma Airbase was constructed after the Battle of Okinawa in 1945. 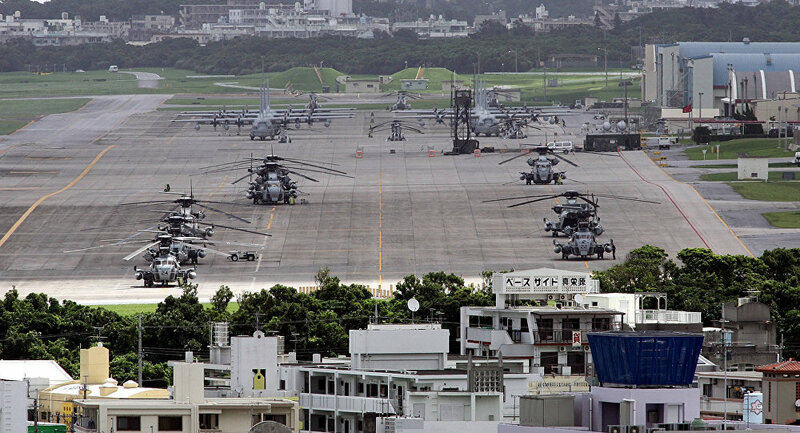 It is one of 16 US military bases and camps in Okinawa and is home for some 3,000 US Marines.